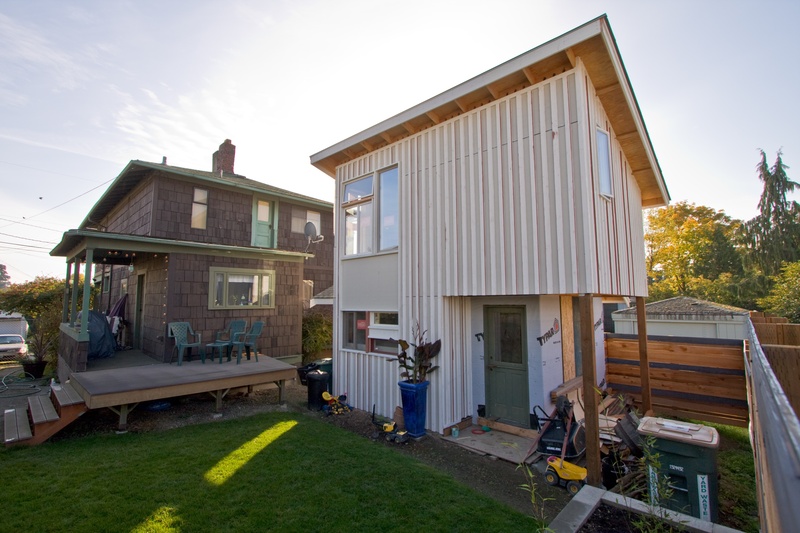 Backyard cottages, like this one in Columbia City, are allowed in southeast Seattle and could be permitted in the rest of the city as early as this fall. A public hearing is scheduled for Sept. 15. The Seattle City Council will hold a public hearing on backyard cottages at 5:30 pm on Sept. 15 in Council Chambers at City Hall. Public comments are welcome and encouraged, according to the Seattle Department of Planning and Development. Mayor Greg Nickels has proposed legislation that would allow more homeowners the option to build backyard cottages, or "mother-in-law" units. The city describes a backyard cottage as a small dwelling unit that is on the same lot as, but physically separate from, a single-family house. Under the proposal, homeowners would be allowed to build backyard cottages under certain conditions. The owner must live on the premises and there would be an annual limit of 50 new such developments. The lot must be at least 4,000 square feet in area, with minimum width and depth requirements. The principal house and backyard cottage combined must not exceed the current 35 percent lot coverage limit for single family zones. Cottages can be no more than 800 square feet in area with a height limit of 15 to 23 foot height depending on lot width. Parking is required. Prior to the hearing, at 9:30 am on August 12th, there will be a briefing to the Planning, Land Use and Neighborhoods Committee, which will serve to open the discussion on backyard cottages. While there will be no public comment period specific to backyard cottages at the briefing on the 12th, there will be a general public comment period at the beginning the meeting. Both the briefing and the hearing can be viewed on the Seattle Channel or online at www.seattle.gov/council. This information will also be posted on DPD's website, www.seattle.gov/dpd/backyardcottages.